A large dataset of high-resolution photographic images of far wakes of a volunteer observing ship (Royal Caribbean’s Explorer of the Seas) has been acquired under various meteorological conditions and ship operation modes. This work presents the description of instrumentation, methodology, and the results of the experiment. Environmental and ship operation factors that affect appearance and geometric properties of ship wakes in photographic and satellite-based radar images have been analyzed. The photo imagery reveals an asymmetry of the wake depending on wind direction relative to the ship course. 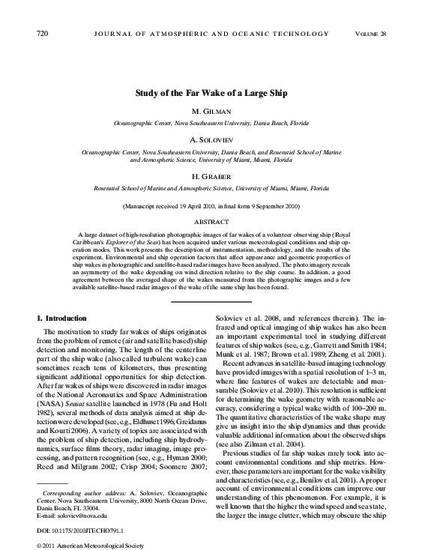 In addition, a good agreement between the averaged shape of the wakes measured from the photographic images and a few available satellite-based radar images of the wake of the same ship has been found.